A passionate haka performed at the memorial of Jonah Lomu. 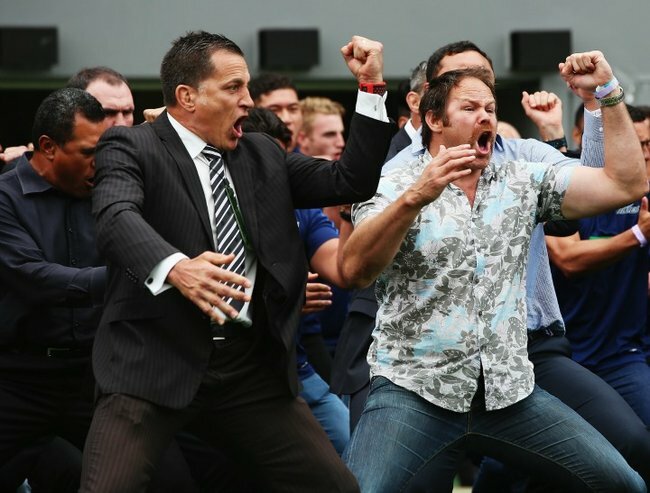 Former-teammates perform a heartbreaking haka at Jonah Lomu's funeral. The haka is stirring at the best of times. But today it was devastating. A public memorial was held for All Blacks player Jonah Lomu today, with thousands attending to pay their respects. Whether you’re a rugby fan or not, Lomu’s presence was larger than life, and his tragic passing earlier this month has been felt around the world. The Guardian reports thousands of mourners attended today’s service at Auckland’s Eden Park. Many donning Lomu’s number 11 jersey to pay tribute to the 40-year-old winger. The memorial began with a haka and powhiri (welcome) performed by representatives of Auckland’s Ngati Whatua people. Lomu’s coffin was carried by pallbearers including former All Blacks teammates Michael Jones, Frank Bunce, Joeli Vidiri and Jerome Kaino. It was followed by his wife Nadene, and his sons six-year-old Brayley, and five-year-old Dhyreille. A private family service will be held tomorrow.